The Union Home Minister elections to the local bodies give the electorate an opportunity to participate in the democratic exercise at the grassroots level. LUCKNOW: Stressing the importance of civic polls, Union Home Minister Rajnath Singh today said elections to the local bodies give the electorate an opportunity to participate in the democratic exercise at the grassroots level. "These elections (to civic bodies) should not be taken lightly. In these polls, the voters get an opportunity to participate in the democratic exercise at the lowest level," he said at a meeting of party workers here in connection with the three-phase polls scheduled to begin on November 22. Noting that all elections were important, be it the case with Lok Sabha polls or Assembly polls, Singh said no one can say for sure which is more, or less, important than the other. Same way, he said, the civic polls were equally important. 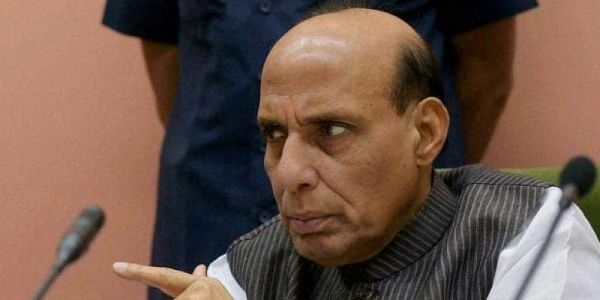 The home minister, who is a Lok Sabha member from Lucknow, said in the civic polls, the voters get a chance to establish a direct connection with the leaders. "This is unlike the Assembly or Lok Sabha elections," he said. Singh said he was happy to see the turnout at the meeting. "Going by the enthusiasm among the voters, I can assert that no force can stop our victory march in these elections," he said. The senior BJP leader said people have realised that the BJP was a party which can give good governance and development. With a view to placate those who could not be accommodated in the ticket distribution, the home minister said "every one cannot be given ticket even if we want to do so". "Go to those who are not happy with the party and mollify them, and even if they shout remain patient...", Singh said. He assured the workers that nothing will be done which will result in their humiliation. Expressing gratitude to the former prime minister and local MP, Atal Bihari Vajpayaee and his local representative Lalji Tandon, Singh said, "Whatever I am today is because of their blessings and the support of the workers." On India's economy, he said "all political parties were shouting in one tune that country's economy has been ruined but a reputed rating agency like Moody's has stated that if there is any economy which is strong it is India's". The ruling BJP in Uttar Pradesh was leaving no stone unturned to ensure victory in 652 urban local bodies across the state. The polls are considered significant for the saffron party, which stormed to power eight months ago with a landslide victory in the Assembly elections. Chief Minister Yogi Adityanath kickstarted the campaign for civic polls on Tuesday from the temple town of Ayodhya, where he sought to convince the electorate that a win for the BJP would ensure holistic development. Counting of votes polled for 16 nagar nigams, 198 nagar palika parishads and 438 nagar panchayats will be done on December 1. More than 3.32 crore voters will exercise their franchise at 36,269 polling booths and 11,389 polling stations.